You'll be £4.99 closer to your next £10.00 credit when you purchase Luck of the Devil. What's this? Robert le Page flew with the Fleet Air Arm from 1940 to 1945, mostly in 816 Squadron flying carrier-based Fairey Swordfish. He saw action mine-laying off Cherbourg, hunting U-boats, escorting convoys in North Atlantic and in the Arctic seas and covering D-Day. Much of his early war years were aboard HMS Dasher and he was lucky to be ashore when the carrier mysteriously blew and sank in the Clyde. This decimated 816 Squadron which was eventually re-equipped and then worked up to operational readiness to fly from HMS Tracker. 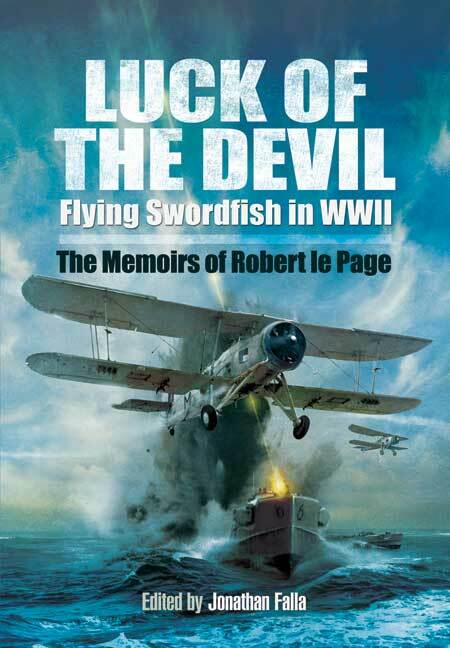 His story is full of insights into wartime naval flying. When they were tasked with finding and attacking German E Boats they found that in a headwind these powerful boats could outdistance the 'Stringbag'. They devised a plan which was to glide as quietly as possible on their approach to the quarry and power up the engine only seconds before they attacked – however they never managed to sink one. Once when landing in rough weather his aircraft was waved to go round again. With throttle wide open the Swordfish struggled back into the air, but alas the tailhook snagged the top wire of the barrier protecting other parked aircraft. The author remembered staring down from the stalling aircraft to see a terror stricken fitter gazing up at him. Fortunately all survived. The story is well worth reading. After the war Robert le Page became an academic linguist. This book is based upon a privately published edition now unavailable. Robert died in 2006 but his son, a dramatist and novelist by profession, has restructured the work to include many new notes and letters written by his late father.